Közzétette: szs Szólj hozzá elsőként! Extracts from Péter Kuczka’s (1923–1999) afterword to Sam J. Lundwall’s It happened tomorrow, published in Hungarian in 1984. The present tense used in the article refers to the mid-80s. Péter Kuczka was the science-fiction editor of the leading (only…) publishing houses dealing with sci-fi, and the founder of the Galaktika sci-fi magazine. Hungarian literature is a part of world literature, being the heir of Plato, prophet Ezekiel, Thomas More, Cyrano de Bergerac, Verne, Wells, the great forerunners of science-fiction and all those fantastic ideas, thoughts and topics that appeared in the works of world literature. However, Hungarian literature is also an independent one, going on its own way and founding its own tradition even in science fiction. The human need that created early science fiction was also working here, appearing in translations, adaptations and original works. The early period of Hungarian science fiction is obviously different from other countries’ beginnings. This genre is very young, its development determined by history. As science started to develop later in Hungary, it was not able to influence literature as it did in other countries like France, England, Italy or later in the USA. The history of Hungarian science fiction started in the second half of he 18th century. Hungary produced many other traditional utopias, allegories and satirical writings at the end of the 18th century. However, we can also find an example for another type of fantastic fiction, the alchemist novel. In the beginning of the 19th century the big changes (economical, scientific and political) provided a good basis for fantastic dreams and social criticism in satirical form, but a pure form of science fiction was also present. The contemporary periodicals published several writings from these kinds. Ferenc Ney sent adventure-seeking Hungarians to the Moon in 1836. Miklós Jósika’s 1847 novel Final Days (Végnapok) describes telepathic humans from Earth who fall in love with women of distant planets and fight strange monsters. Jósika’s book is a science fiction novel even according to our modern standards. His work is followed by Mór Jókai’s fantastic writings. 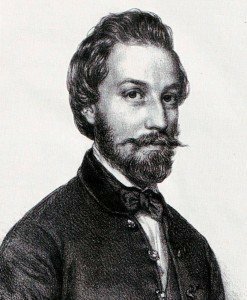 Jókai is one of the greatest Hungarian novelists, his books were extremely popular among the readers of the second half of the 19th century. He tried himself in almost every subgenres of science fiction. He wrote a story about Atlantis (Oceania – Óceánia), a utopian Robinson-story (Where Money is No God – Ahol a pénz nem Isten), a harsh fantastic satire (Up to the North Pole – Egészen az északi pólusig) among many other wonderful stories. His biggest work from this kind was a long utopia published in 1872, A Novel of the Next Century (A jövő század regénye). In the beginning of the 20th century the writers of the famous literature magazine, the Nyugat (“West”) produced artistic level of science fiction. Almost all of these mainstream authors were interested in fantastic writings, a great SF anthology could be compiled from the writings of Kosztolányi, Csáth, Cholnoky, Balázs, Kaffka and others. The greatest of them was Frigyes Karinthy, an apostle of reason and sense, a real heir of Swift and H.G. Wells, considering his fantastic writings. AI machines (robots) are the heroes of his novel Voyage to Faremido (Utazás Faremidóba), these artificial creatures appeared in this novel before Karel Čapek created his robots. 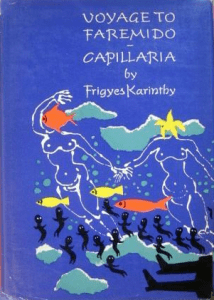 In one of Karinthy’s other novels, Capillaria (Kapillária) the conflict between men and women reaches a fantastic scale. Between the two world wars Hungarian science fiction developed greatly, producing writings in a wide range of topics and quality. Stories were published about space adventures, Mars travels, future wars, fantastic inventions, strange aliens and robots, covering all the well-known topics of world science fiction. Some of the outstanding novels were written by Mihály Babits. The Stork Caliph (Gólyakalifa) and Pilot Elza or the Perfect Society (Elza pilóta, avagy a tökéletes társadalom) represented pure science fiction with high literal and philosophical value. The second novel is a part of the writer’s anti-war works, expressing his worries about the evolving fascism. The plot has two storylines. The first is the history of the Kamuthy family in the times of never ending war, the second is a story of scientists and the creation, development and doom of an artificial planet, the “Little Earth”. After the World War II the status of science fiction changed dramatically in Hungary. The first post war decade was not very friendly towards this genre. Writers were interested in actual problems, the horrors of yesterday and the problems of today. They were not open to futuristic war inventions, new chemical materials or atomic weapons. Moreover, the official, state-led cultural politics did not encourage SF writings. Hungary got to know Soviet fantastika and the theories connected to it. The communist leadership of the 1950s considered science fiction as a form of youth literature to popularize new scientific discoveries. The leaders were only interested in the future until the end of the actual five-year-plan. The big change arrived in the middle of the 1960s. The newer political and economical enviroment let us meet the great authors of world sci-fi like Bradbury, Simak, Vonnegut, Carsac, Pohl and many others. Not only novels, but other fields of science fiction became available: films, secondary literature, arts. The new wave of Soviet sci-fi also had its influence (Ivan Yefremov, the Strugatsky brothers). This is the starting point of modern Hungarian science fiction. Gyula Fekete is an excellent realist novelist. Being a devoted supporter of society improvement, his SF writings are rather utopian. Even the stories on the planet Venus or undiscovered islands deal with the problems of today, placing the questions into other environments to be answered there. The novel Planet of Lovers (Szerelmesek bolygója) focuses on the youngsters’ morals, the Trisex (Triszex) on the future changes in family life and human relationships, and his best-known The Blue Island (A kék sziget) is a classical utopia about a happy society living in harmony. Gyula Hernádi’s role is also important. Being a restless, novelty-loving author, he writes in many genres and attracts the attention of critics – most of the times not only in positive ways. His most interesting writings are his short stories, where the realist and surrealistic styles are blended with real and fake documents. He also writes about classical characters like Jack the Ripper or Dracula. Zoltán Csernai could be called a typical science fiction writer of ours. He is one of the most popular writers. His main topic is the meeting of aliens and humans in historical times and also in the present. (Secret on the Top of the World, The Legend of the Flood, Atleontis – Titok a világ tetején, Az özönvíz legendája, Atleóntisz). The best of his short stories is Pebbles (Kövek), which is maybe the best Hungarian science fiction story. 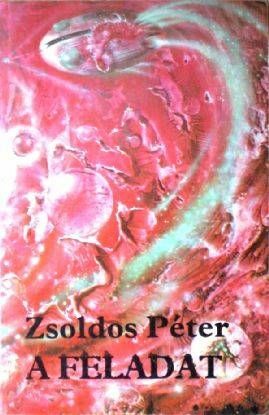 Péter Zsoldos writes classical, American-style science fiction. Space travel and robotics are his returning topics, forming the basis of his well-edited novels like The Task (Feladat) or The Viking Returns (A Viking visszatér). A new generation of writers are also important for us. These authors grew up reading modern science fiction, read the classical works and rejected the cheap, empty writings. They are using the tools of science fiction to find answers for their own questions, often expressing themselves in allegories and parables, getting closer to the mainstream literature. Their most important representative is Péter Szentmihályi Szabó. In his collection of short stories, The Invincible, he writes about many topics of the genre, his novel The Perfect Version (A tökéletes változat) is a dystopia in the distant future, facing different forms of society. Béla Kasztovszky uses autobiographical and poetic elements in his short story collection, A World for Two (Kétszemélyes világ). The two most prolific writers are László L. Lőrincz (penname: Leslie L. Lawrence) and István Nemere. Lőrinc (who is an internationally acclaimed expert on mongolistics) puts moral questions into a sci-fi setting, dealing with crime and punishment or social isolation. Two of his popular novels are The Long Safari (A hosszú szafari) and The Underground Pyramid (A földalatti piramis). Nemere writes adventure stories, among them the more valuable are those close to political science fiction like The Whip of the Cosmos (A kozmosz korbácsa), the Steel Shark (Acélcápa) or maybe the best, Action Neutron (Neutron-akció). Some scientists consider science fiction as a good way to make people interested in science. They think that real science fiction should always respect scientific facts and the laws of the nature, for example a spaceship could never be able to travel faster than light. We accept and appreciate them and these works in science fiction, for example the astronomer György Kulin’s novels (co-authored by Zoltán Fábián, under the penname Q. G. Lyn and A. F. Bian ). Some scientists also wrote books for children using science fiction. Tibor Dévényi was a scientist writing science fiction too, although his main point was not to educate but to show the anomalies of scientific life and bureaucracy (later the Hungarian society), using ironical and satirical humour in his novels and short stories.